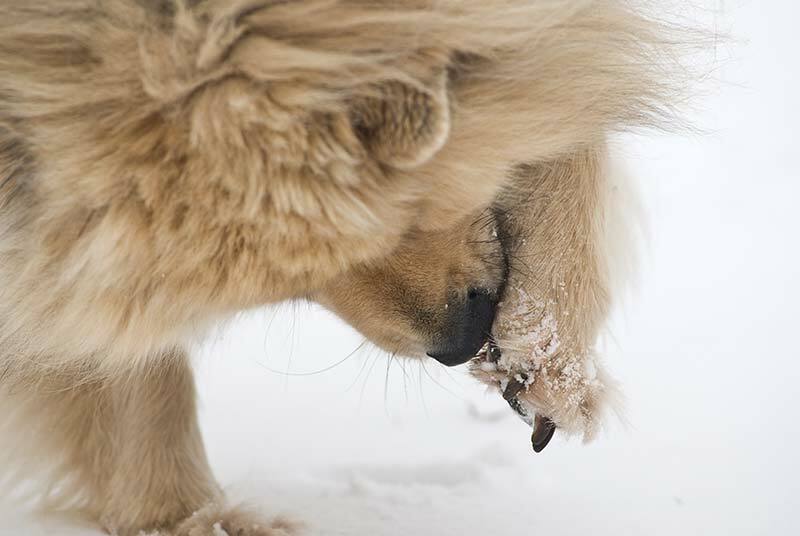 Grooming – Keep the fur around your dog’s toes clipped and their nails neatly trimmed to help prevent the accumulation of snow and ice in between the pads. Cleaning – Salt and chemical deicers can not only damage paw pads, they can also be toxic if licked off and ingested by pets. Get into the habit of thoroughly wiping your dog’s paws with a warm, wet washcloth after each trip outside. You can also gently clean the paws using a mild hypoallergenic, pet-specific grooming shampoo. Be sure to rinse thoroughly and dry the paws carefully with a soft cloth. Protection – A thin layer of protective balm, such as Snout Soother (available for purchase in our lobby) or Musher’s Secret, applied to the paw pads prior to heading outdoors can also be helpful. If you do a lot of outdoor walks or other winter activities with your dog, you should consider purchasing a set of waterproof booties, for ultimate protection. Just as in humans, dogs are susceptible to hypothermia, frostbite, and other cold weather ailments. Adjust your walks and outdoor playtime accordingly, and remain alert to any signs that your pet is uncomfortable or in pain. Stop the activity and get your pet indoors if you see your pet lagging behind, shivering, limping, or you observe any loss of coordination. As always, please contact us at Lone Tree Veterinary Medical Center with any questions you have about caring for your pet or winter paw protection. We’re here every day and love helping pets have better lives!